The story of his ancestors told by Philip Martin, gives a fascinating insight into life and rural society in Box in Victorian and later times. It includes the opening of an electrical shop in the Market Place and the decline and ultimate demise of Spencer's Farm, a smallholding at Ashley. The Martins have been in Box for at least 150 years. Charles Martin (born 1817) wanted to be a shepherd but worked mostly as an agricultural labourer. He probably came from Marshfield because his youngest children were born there but in the years 1861 to 1881 he was living at Wormcliffe, Ashley with his wife Mary E and children. The children secured work in related agricultural trades; in 1881 George was described as a Brewer and Henry as Cowman, Ag Lab. George Martin is an important person later in this article but at this point we have to break the narrative of the Martin family, in order to trace the history of two other Box families: the Spencer and Nowell families. The Spencers originated from Kington Langley, Chippenham. We know that they were comfortably off because in 1840 John Spencer let out two properties in Box. One was a cottage, outbuilding and Barton (the farmyard previously owned by lord of the manor) which he sub-let to the Hancock, William and Tye families. Clearly the farm had previously been large, covering The Barton and Littlemead areas but was by now mostly let out to generate an income. The other property he owned was the Swan Inn, outbuildings and garden which he sub-let to the pub's licensee William Sweetland. John Spencer married twice. The first was Elizabeth Sweetland, 21 years his senior, who was still alive in 1851. The second was Ann Nowell (b 1829). I have an old family Bible which has the entry William Nowell His Book Sept 1841. There follows a few entries of births and deaths of the Nowell family. In 1861 John Spencer and Ann lived with Ann's widowed mother at an unidentified farm in Ashley (presumed to be Spencer's Farm) said to comprise 12 acres. On such a small acreage the home farm was clearly no longer viable as an independent unit. We can go further because in 1891, the farm is referred to by its old name Shrub Farm, Ashley and John calls himself a small farmer. We might imagine that the land was poor because the word shrub was used to identify the small woody plants that grew there, perhaps harvested as canes for domestic and garden use. This might explain why John referred to himself as Gardener retired in 1901. So we now return to the Martin family and George Martin who married Susanna Spencer, the sixth child of John Spencer and Ann Nowell. By 1901 George called himself a farmer and the farm had changed name to Spencer's Farm but again we see that the business was unprofitable because by 1911 he described himself as Carter for Brewery. My mother never met her father-in-law George Martin who died eight years before she married but she understood he was a jolly sort of man, but that is all she knew. Perhaps you can see this in the photo above which appears to show George wearing his drayman's apron. The farm was rented from the Northey family and was one of the many that was put up for sale in 1912. It only comprised 13 acres but had an annual rent of £40 plus an apportioned tithe rent charge of £4.1s.8d. The farm was described as having a piggery, two-stall stable, cow-house for seven cows and outbuildings, but the farmhouse was clearly in a poor condition: Old fashioned stone and thatch with parlour, kitchen, pantry, wash-house, dairy, four bedrooms, well water, and capital garden. My father did once mention that they used to have a side of pig hung up in the kitchen (salted I think), so that would fit in with the holding having pigs, and my father certainly knew how to handle pigs, as some local pigs got caught in a flooded outhouse once and he got them out, which impressed the owner. 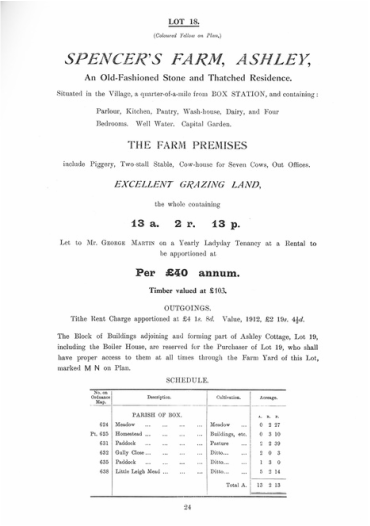 Many of the Northey farms failed to sell and the tenants held on until 1920 when scores of farmers sold their live and dead stock having quit the farm. There is no record of George Martin selling up in this way. Perhaps the farm had declined so much that an auction was deemed unnecessary. Norman Martin was born at Spencer's Farm, a smallholding at Ashley, Box on midsummer’s day in 1901, the same year that Queen Victoria died. He was the second son of George Martin and Susanna Spencer who had farmed the holding that had been in the Spencer occupation since around 1850. Norman’s elder brother sadly died aged seven just before Norman was born so Norman grew up as an only child and attended Box School. He had little interest in taking on the smallholding, and so in 1917, aged about 15, he became an apprenticed electrical engineer, paid four shillings per week, with Stothert & Pitt Ltd of Bath, whose famous cranes could be found at docksides worldwide. 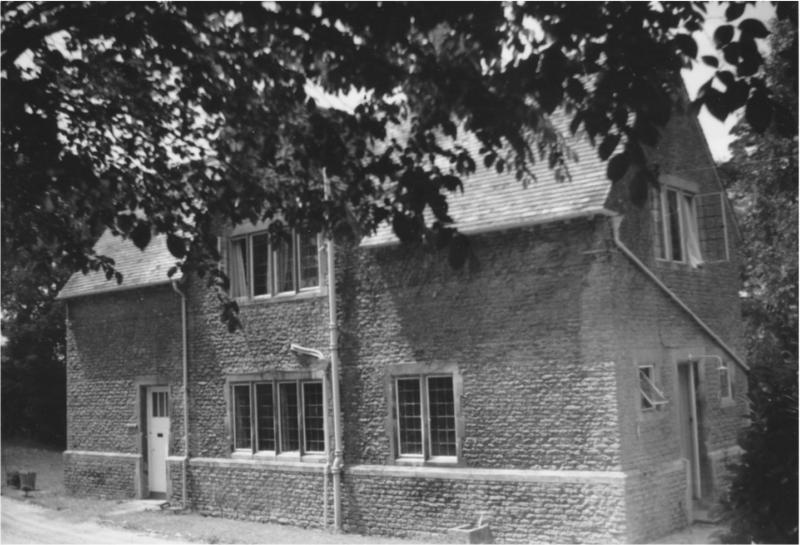 Norman’s parent’s, George and Susannah, had both died by 1922 and as the property and farm equipment was sold up, Norman, then aged about 19, went to live with his aunt, Alice Martin, sister of Norman's father, at No 1 Ashley Villa, opposite the Northey Arms. His uncle Ted Martin lived at Ashley Manor Cottage where he worked as a gardener. As was the case in those difficult trading times Stothert & Pitt were short of work, and apprentices were not offered situations beyond their training completion. So Norman then obtained a position with an electrical contractor in Bath. 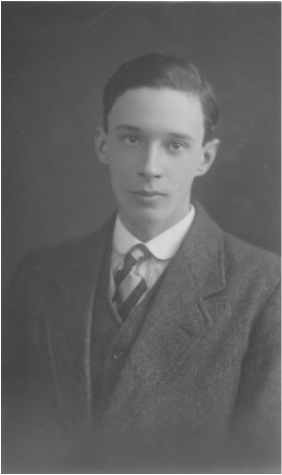 In 1930 Norman married Evelyn Giles who was born and grew up at 6 Bath Road (now High Street). 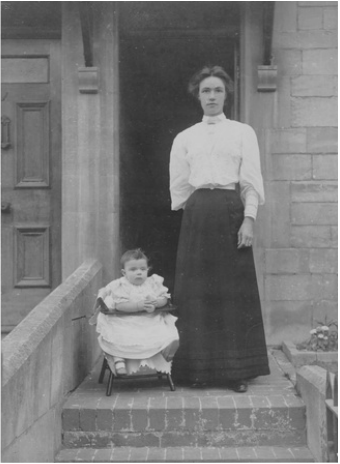 Evelyn was the daughter of Sidney and Rhoda Giles who had moved to Box from North Bradley near Trowbridge around 1905. 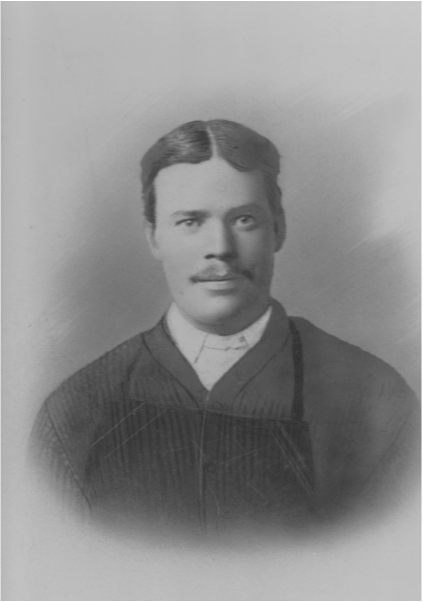 Sidney Giles was a miller, and had learned his craft at the nearby Yarnbrook Mill, near North Bradley, but work at Box Mill was a better position, and so he and Rhoda moved there and remained there until he retired. Box Mill was then owned by the Browning family, but was sold to Chelsea Food Products, part of Rank Hovis McDougal at the early part of the war, when semolina became the main product. When she left Box school Evelyn trained as a tailoress working for a gents’ outfitters in Bath, hence was very skilled at making clothes of any type from any material, which was invaluable during the make-do-and-mend war years. Subsequently she worked as a lady’s maid for an ecclesiastical family in Lansdown Crescent, Bath, and then for a wealthy family in Kent as maid to their two children. 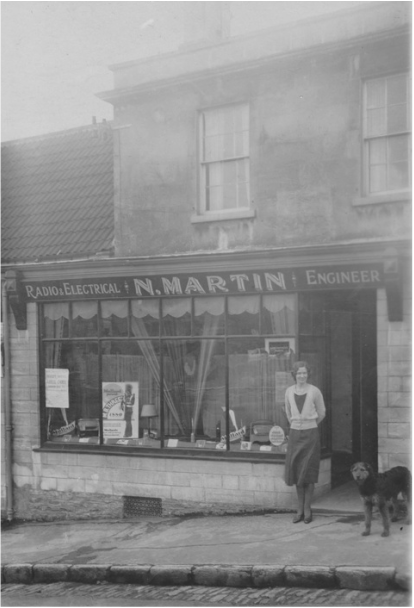 In the early 1930s a radio and electrical shop was opened in Box at No 1 The Parade by WH Rossiter, Electrical Contractors of Bradford-on-Avon. Norman took over running the business as the local agent, eventually buying the Box concern. 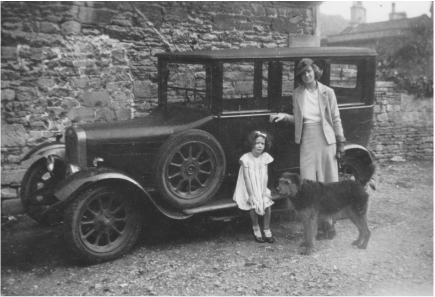 During this time Norman and Evelyn lived in the accommodation over the shop and their daughter Esmē was born there in 1931. Esmē developed a remarkable skill at the shop. She taught herself to write upside down whilst sitting on the counter of the shop, so customers could read the note. Norman became known as the person to call for any radio or electrical work in the village and one of his major projects was the installation of the lighting in Box Church. The survey and supply of the electrical fittings and equipment was undertaken by Hollophane of London (who are still trading) with Norman doing all the installation work. He also provided the lighting for the Bingham Hall and was subsequently much in demand for the lighting of any theatrical productions in the Hall. Throughout the war and for many years afterwards he supplied free maintenance for the lighting systems in the Church and Hall. However, this was the 1930s, and a period of depression, and it was a difficult trading time. They did however aspire to running a Clyno car, which was prone to spring failure so a block of wood was retained for emergency roadside repairs. Motoring was an adventure in those days! To supplement income from the shop Norman sought work elsewhere and for a time was a salesman for Hoover, but the war was approaching and it was decided to cease the business and leave The Parade. Norman managed to secure a post as electrician with the War Department working at The Ridge underground munitions store near Neston. The family moved to No 5 Bath Road (now High Street), which was next door to Evelyn’s Parents in No 6. Not an ideal move, but necessitated by circumstances. Very soon after, in 1939, the war was declared and son Philip was born in the November of that worrying time. Norman was now 38 and in a reserved occupation, so was not called up for military service. As for most people, life changed considerably for the family. Having two children and living in a small, (three bedrooms, but no bathroom then) terraced house did not preclude the billeting officers from allocating two WAAFs to be accommodated. The little house became even more crowded when relatives from Bath arrived after the blitz. Fortunately they had departed by the time doodle-bugs were landing on London as relatives from there descended saying they could tolerate bombs from planes being flown by men, but not pilotless rockets which landed anywhere. Box Home Guard assembly. We welcome the names of anyone you can identify. Box Home Guard had been formed soon after the start of hostilities, and Norman, together with many local people who were either in reserved occupations like farmers, or others waiting call-up or over the age of enlistment formed the Box Company under Col Morley. During the war Norman continued working at The Ridge, which was a part of the Central Ammunition Depot – a massive storage complex holding artillery shells, bombs and other munitions. When hostilities finally ended life began to return to normal. Esmē continued her education at Chippenham Grammar School and Philip attended Box Church of England School. Esmē was a quiet studious girl who readily absorbed the grammar school curriculum, but Philip, on the other hand found Box School tedious, boring and totally lacking in anything to interest him. Evelyn joined the Badminton Club which had been restarted in the Bingham Hall, and was involved in the Women’s Institute and its drama group. Regular plays were produced and enacted for the village entertainment in the Hall. At about that time in the early years after the war, the Box Gay Nineties dance club, an old time dance club, had started weekly sessions at the Hall. It proved very popular, and both Norman and Evelyn together with their close friends the Haywards and many other Box couples became keen members. As was the case before the war, Box was again becoming a lively village with a great range of organisations and activities, some centered around the St Thomas à Becket Church and others independent. The Football Club was in great need of a new ground as it used one very sloping end of the Recreation Ground, whereas the Cricket Club enjoyed a decent pavilion and ground watched over and maintained by Mr Hemmings who fiercely ensured no harm came to the central, fenced off, wicket pitch. Children were allowed to play in the remainder of the Rec. unhindered and it was the area of choice for all sorts of activities and impromptu games of cricket, football and everything else that children enjoy outdoors. By 1949 at age 16 Esmē left school to enter the Civil Service. As was the case in those days, having passed the entrance exam your appointment was at the whim of the Civil Service Commission and you could be sent anywhere in the UK. It mattered not that the Admiralty had a huge organisation nearby in Bath with lots of suitable vacancies, so Esmē was sent to the Tithe Commission (no longer exists) in London. Philip meanwhile still had little interest in the educational offerings of Box school, and there was no attempt by the school, under the headmastership of Gaffer Adams, to provide any. Hence a failure of the 11-plus was almost a given. 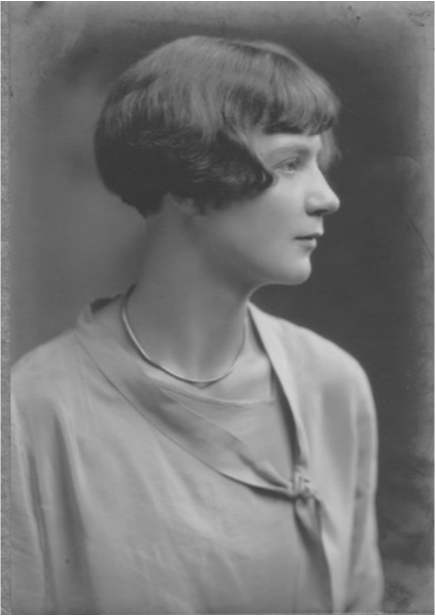 Evelyn, who was now on the newly formed Parent – Teachers’ Association, was not inclined to accept the hopeless verdict of the School however and with some home work and coaching an entry was achieved into the excellent City of Bath Technical School, which Philip found stimulating and fulfilled all the needs that Box School failed to provide. Philip was in the Church Choir at this time, and Evelyn was invited by the vicar, Rev Lendon Bell, to join the Parochial Church Council and Norman became a Church sidesman. Evelyn, meanwhile, had been working part time in the dry cleaning agency Kilmisters next to the Post Office, which was used by many people from Box and the surrounds. From this came a contact and an offer of holiday work for Philip to help with Eric Bayliss’s horses and stables at Lower Ashley. Eric Bayliss was well known for his stables and riding school before the war, but he now concentrated on breeding Palomino Horses at his Stud there. He was a fairly well-to-do gent of some standing in those days and Philip greatly enjoyed the opportunities to help, generally working around the place and assisting with horse show exhibits. After a while Mr Bayliss offered the rent of an empty house he owned to the Martin family. After much deliberation it was agreed that the move from 5 Bath Road (now High Street) would be a good one, particularly as Evelyn would no longer be living next-door to her parents. And so in 1954 a move was made to Ashley. A couple of years later Eric Bayliss decided to sell-up everything and move. The Martins then moved from their rented house to buy the more attractive property that had been occupied by Eric Bayliss, which he had called Ashley Stud, on account of the horses he bred, and they called the house Ashley Firs, which is still its name today. Esmē had married George Whittle in London in 1960 and lived in Streatham until they and their two children emigrated to New Zealand in 1967. Norman retired from the Ministry of Defence in 1968 and continued living at Ashley Firs until in poor health he died, aged 70, in 1972. Later that year Philip married, the house was sold, and Evelyn, together with her mother, Rhoda, who had sold her house in High Street, bought a house in Corsham where Rhoda died aged 90 in 1975. Evelyn continued living in Corsham until she moved to the Vine Court sheltered accommodation back in Box. She died aged 76 in 1984. 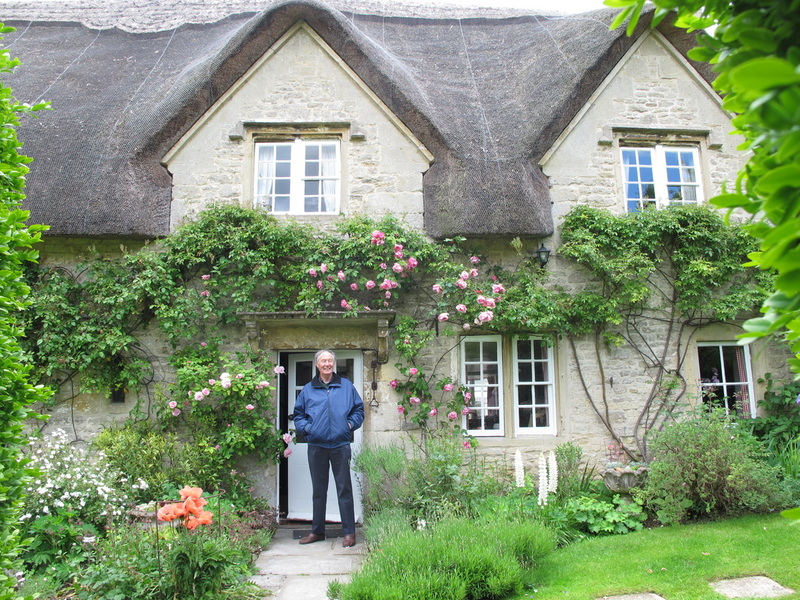 Philip Martin visiting Spencer's Farmhouse in June 2015. Charles (b 1817) married Mary E (b 1826). Children: William (b 1848); Mary A (b 1850) and George (b 1859); Henry C (b 1863); Edward (b 1865); Alice A (b 1869); Charles (b 1871). George Martin had brothers I think, because there was a family branch who had a greengrocery shop in Southampton, supplied by a market garden they had at Ampfield near Romsey. So my father had a cousin, also called Norman Martin, that we used to visit regularly in the 60s and always referred to as the Southampton Martins. 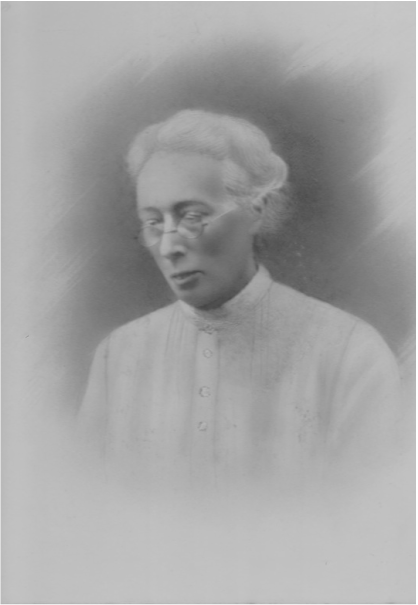 John (b 1827) was married to a. Elizabeth Sweetland (b 1806) and b. Ann Nowell (1829 - 2 June 1897). Children: a. William (b 1850) and b. William Thomas (b 16 August 1850); Catharine (b 1 July 1852); John Henry (11 May 1855 - 31 October 1879); Frederick (7 January 1858 - 24 November 1859); Frederick (6 February 1860 - 8 May 1866); Elizabeth (b 28 April 1862); Susanna (b 28 October 1864); Walter (b 4 April 1868).